Every once in a while, someone will ask why our cleaning cards have their distinctive “waffle” design with a grid of alternating raised and indented bumps. Some of our long-time customers might remember that they weren’t always this way – for years, our standard cleaning card was simply a flat, cotton-lined piece of thin cardboard soaked with rubbing alcohol. In fact, it worked basically the same way as an oversized alcohol wipe, only a bit stiffer so as not to get torn apart by the rollers when passing through a scanner. The raised bumps clean the track better. It may not seem like something that would be important, but we didn’t pick the waffle design just because it looks nice. The alternating raised and indented bumps actually expand and contract as the card passes through the scanner’s paper path, keeping constant pressure against both sides. The old, flat cards, by contrast, had to be slightly thinner than the width of the track, and therefore, they were only in contact with one wall at a time. 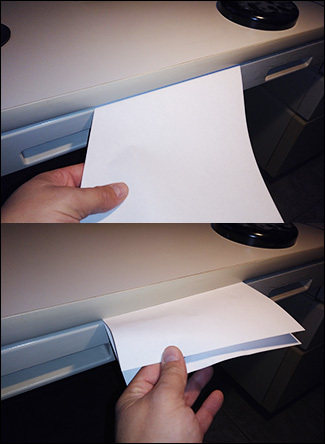 To demonstrate this, try taking a piece of printer paper and sliding it through a narrow space, such as the gap at the edge of a closed door, or between two desk drawers. It is physically impossible for the paper to be touching both sides at once at any given point. Now, fold that same piece of paper in half (without creasing it), and slide the folded edge through the same gap. The paper rubs against both sides, in contact along the whole length of the sheet, with noticeable pressure. If you were trying to clean dust out of that gap, which shape do you think would work best? That’s the same principle behind the waffle design of our cards. The solvent lasts longer after the package is opened. One of the big issues with alcohol wipes is that once they are opened, the alcohol evaporates quickly. Alcohol-based cleaning cards are no exception: We previously recommended those cards be used within two minutes of opening the package. 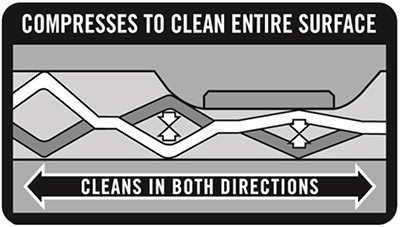 While the physical act of cleaning a scanner takes less than half that time, if there was any kind of problem – computer issues, work-related interruptions, the operator becoming confused, or just opening the card too soon – it was easy to end up with a card that was on its way to drying out, and consequently, less effective at cleaning. The newer cards use a different solvent that stays fresh for upwards of five minutes, giving you plenty of time to run through the cleaning cycle. Changing regulations regarding isopropyl alcohol. When we first entered the scanner business, rubbing alcohol was considered a pretty benign material, and it wasn’t especially difficult to store or ship. Basic precautions had to be taken since it is technically flammable, but those amounted to little more than common sense. As time went on, however, a continually expanding web of regulations – at the state, federal, and international levels – began treating alcohol as an ever-more hazardous substance. Packaging requirements, labeling requirements, and shipping requirements were all introduced, adding significantly to the cost and effort of handling it. While we don’t really think rubbing alcohol is any more dangerous than it was before, it eventually became easier to use something else – and as you just read above, other benefits of the new solvent make it a bit easier on the customer as well. Standardized cards between Digital Check and SmartSource lines. Before our company acquired the SmartSource line of scanners (also in 2016), both product lines both had their own waffle cards, but with somewhat different patterns. After extensive testing, we found that one design – formerly the “Digital Check” pattern – could clean both brands of scanners equally well. Since then, we’ve used a single cleaning card to eliminate the need for our customers to carry, and keep track of, two kinds of cards. Better cleaning of the camera glass. The camera has always been one of the most difficult areas of the scanner to clean, not only because it is especially sensitive to dirt and dust buildup, but because both sides have to be sparkling clean to capture a good image. This is another place where the thickness and the constant outward pressure of the waffle design come into play, making it especially well-suited to scrub both sides at once. Previously, no matter how well you cleaned a scanner, often times it would still be necessary to wipe down the camera glass by hand periodically. The flat cards were not guaranteed of contacting every part of the paper path – especially further down the track – and this included the camera glass. A little bit of leftover dust on the sides of the track doesn’t really hurt much, but the camera is much more sensitive to uneven cleaning, and over time, the buildup could become a problem. With the new cards being better at reaching this hard-to-get area, we now recommend cleaning the camera glass manually only in rare cases where there are visible streaks on the images.